Home — Displays content in a unique home page layout as in the theme demo. Also, the Home template often requires additional setup within the Customizer. Full Width — Display a full width page without any sidebars. Blog — Display posts from a category selected within the theme options. Portfolio & Testimonials — Display posts with Featured Images from a category or the Jetpack portfolio custom post type. Landing — Displays a page with no header or footer. Generally used as a Coming Soon or Maintenance page. 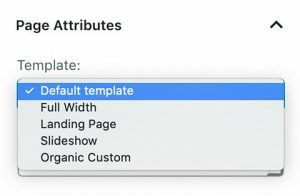 Organic Custom — The page template supplied by the Builder Widgets plugin. It allows you to build custom page designs using widgets. Page Templates are applied within the Page Attributes section of the page editor. Additionally, Templates can also be applied within the Quick Edit options as seen below. There are a variety of Page Templates included with Organic Themes, and some themes have more than others. Below, we will provide instructions for the setup of common Page Templates. Navigate to Pages > Add New to create a new page. Add your page title and content. Within the Page Attributes section of the Document settings, choose the “Full Width” template. Navigate to Appearance > Menus to add the page to your custom menu. Within the Page Attributes section of the Document settings, choose the “Blog” template. Navigate to Appearance > Customizer > Theme Options to configure your blog page. You may need to select a category for displaying a particular group of posts on your blog. Within the Page Attributes section of the Document settings, choose the “Portfolio” template. Navigate to Appearance > Customizer > Theme Options to configure your portfolio page. Note: For themes with a filterable portfolio, the filters are sub-categories of the category selected within the theme options. For example, you could set a category such as ‘Portfolio’, then create sub-categories as filter options: ‘Photography’, ‘Illustration’, ‘Painting’, and so forth. Jetpack: Many of our themes are compatible with the Jetpack portfolio post type. If the Jetpack plugin is active on your site, portfolio posts (Projects) will display on the “Portfolio” Page Template. Within the Page Attributes section of the Document settings, choose the “Testimonials” template. Navigate to Appearance > Customizer > Theme Options to configure your testimonial page. Jetpack: Many of our themes are compatible with the Jetpack testimonial post type. If the Jetpack plugin is active on your site, testimonials will display on the “Testimonials” Page Template. Within the Page Attributes section of the Document settings, choose the “Slideshow” template. Add a WordPress image gallery within the page content. Note: The image slideshow will be created from the first gallery added to the page content. Slideshow images will display in the same order as they appear within the gallery. However, the gallery itself will not appear within the page content — only the slideshow. Gutenberg: If you’re using the WordPress 5.0+ Gutenberg block editor, galleries must be adding using the “Shortcode” block, and the gallery shortcode.